Dahon, the world’s largest producer and marketer of folding bikes, celebrated its move to larger manufacturing facilities earlier this month that will enable it to double production to 1 million bikes a year. The California-based company relocated to a new complex in the Songgang district, after 13 years at their fully owned factory in Shajing, Shenzhen, which opened in 2001. The new factory is close enough to the old location for Dahon retain most of their original staff. With 60,300 square meters of floor space and ISO9000 and ISO14000 certification, the new factory (shown at right) enables Dahon to double annual production to one million units, while maintaining the quality levels expected from a leading brand. Dahon retains its on-site lab and testing facility, being one of very few manufacturers in the country licensed to do in-house testing. Dahon timed official opening ceremonies to coincide with its 2014 Dahon China Distributor Conference, which drew around 200 distributors to the location Nov. 10-11. Dealers joined suppliers and government officials for a tour of the factory, product and marketing presentations and evening entertainment, including a traditional Chinese lion dance and staff prize draw. China’s domestic bicycle market continues to go from strength to strength, largely due to the increasing interest in fitness and leisure cycling amongst the middle classes. 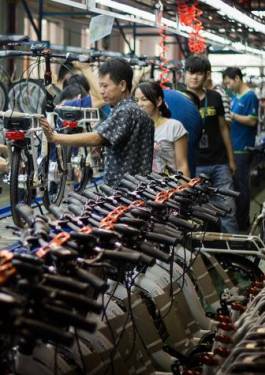 Dahon holds the number one spot for folding bikes in China, as in the global market. Top performing distributors were awarded for outstanding sales with Ms.Yuan of Guangzhou coming in at first place. Headquartered in California, Dahons offices, factories, cooperating assembly plants and distributing partner network reaches around the world.